A 1934 Daimler 15 Coupe by Mulliners of Birmingham. Homepage. 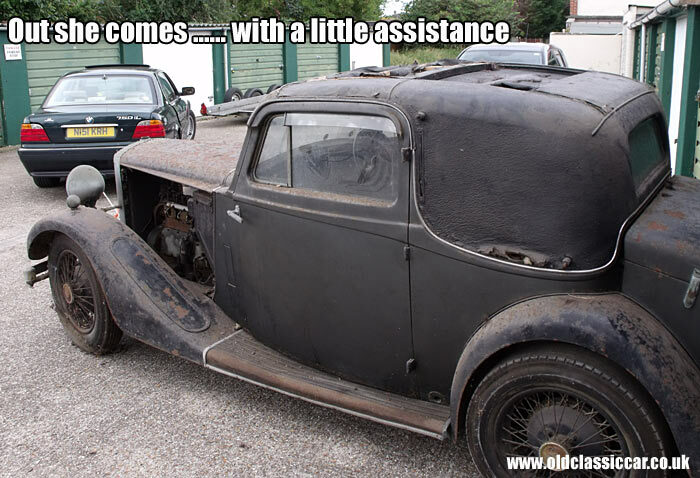 This page: Barn-find-condition cars are still out there, as proven by this '34 Daimler 15hp Coupe. 1934 Daimler 15 Coupe by Mulliners. Thinking about it, rarely do I end up buying a classic or vintage car that runs. For some reason, discovering a laid-up old motor, covered in cobwebs and dust following a lengthy lay-up in some almost-forgotten barn, shed, or garage, is far more appealing to me than simply buying a shiny car out of the classifieds. 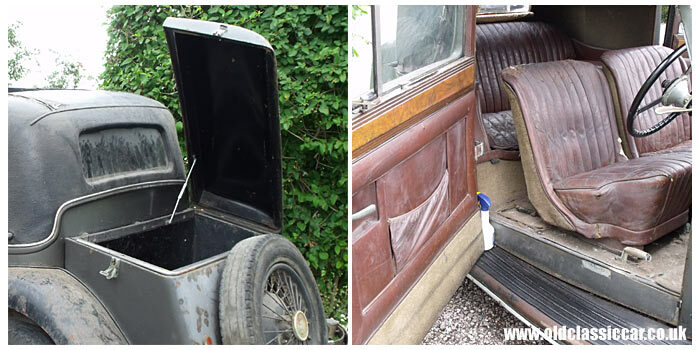 Despite the passage of time, interesting pre- and post-war cars are still out there, hidden away out of sight for many years, and often residing in the most unlikely of places. Some time ago, for instance, I went to look at an Austin 10/4 Cabriolet identical to my own example. Not in some remote barn or secluded lean-to, but parked in the back of a modern warehouse, behind the company owner's stock room. It hadn't been used since the 1960s, and as far as I know it's still in the same Midlands location. This 1934 Daimler 15, in rare two-door Coupe form, is a product of coachbuilder Mulliners of Birmingham (who coincidentally bodied my Dodge lorry during WW2). Most Daimler 15s of the era were produced as rather dignified saloons, with coupes and cabriolets also on offer. This coupe had resided in an anonymous lock-up garage, hidden from view since the 1960s. The vendor was in the process of clearing the possessions of her late brother. He had been given the Daimler by their Aunt and Uncle in the 1960s, and as far as I know he simply parked it in this garage and left it there to gather forty-plus years of dust. The first picture I saw of the car was a sneak preview, taken by the owner from underneath the (bent) garage door. At the time they couldn't find the keys to the lock, so simply poked a camera under the damaged panel and clicked away, hoping that something would be discernable. The photos revealed a dusty Daimler, speckled with surface corrosion, flaking paint, and pickled chromework. Clearly it hadn't run for quite some time, and its mechanical condition was, and still is, unknown. Daimlers of this era are fitted with a fluid flywheel and pre-selector gearbox. The general view is that this is a reliable system, but not one that takes particularly kindly to long periods of idleness. Negotiations continued on and off for several months, in the end an offer above the estimate provided to the owners by one or two specialist old-car auction houses secured the car, and a date and time were arranged for collection. By this point, the owners had been able to open the garage properly, and had already shown it to at least one other interested party. Extracting the Daimler from the garage. Collecting the Daimler required a long journey, dad volunteered to come along for the ride, and his faithful old 7 series BMW was pressed into towing duties. We were taken to a row of lock-ups, in a suburban setting that could have been anywhere in the country. 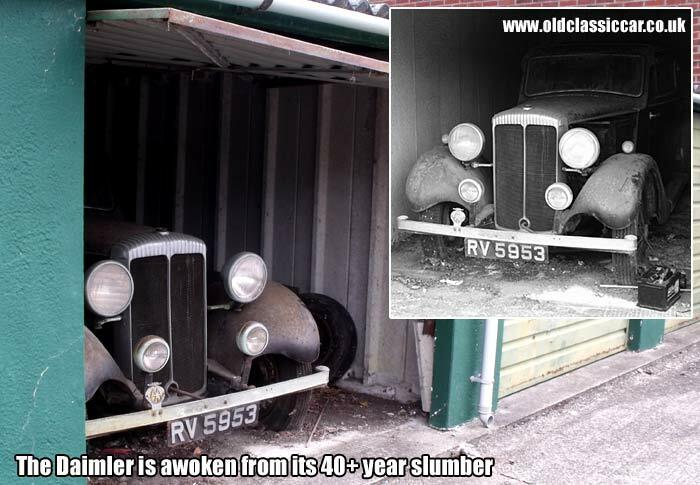 The up-and-over door was raised, and there sat the Daimler, blinking in the daylight. By this point I'd committed to buying the car, so we had a quick look around it before planning its removal. All four tyres were as flat as pancakes, and the interior exuded an aroma of age, and just a hint of long-gone mouse activity. The two-tone paintwork was in poor condition, with little of the black finish remaining on the bonnet especially. The once-shining radiator surround and lamps were showing their age, as were the other items of brightwork. On the plus side, the structure appeared to be in reasonable fettle, mercifully the garage roof was in good order and hadn't allowed rain water to leak onto any part of the car. Despite this, the roof covering on the car was found to be in a bad way. 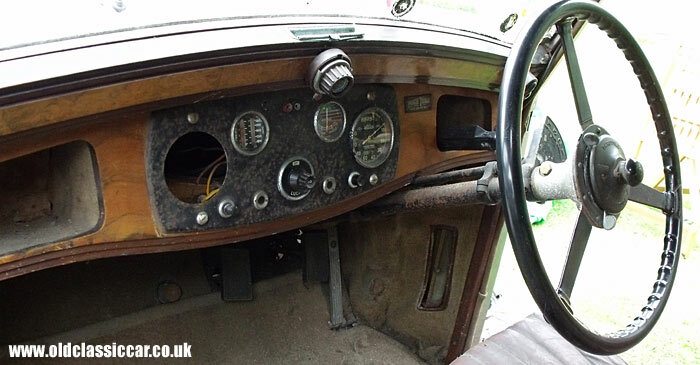 Whereas some coupes of the 1930s have a steel roof, covered in Rexine, the Daimler has a roof which comprises a wooden frame, onto which various layers of material, padding, and wire mesh, are fitted, not unlike that found on post-war Riley RMs. This hadn't survived too well, material from the sliding roof and headlining hung down sadly, while the covering to the sides of the roof revealed their inner layers. I think the roof, and maybe the transmission if it proves to be problematical, will probably be the trickiest areas to deal with when the time comes. At least all the roofing material is present and usable as a pattern, which is a bonus. Three of the four tyres held air, but the nearside rear tube refused to play ball. Because of this, we decided to tow it out gently as there was no way we could push it. With the old Daimler in the daylight at last, we could finally see what I'd bought. Overall it was more or less as I'd expected it to be, although a little more paint would have been nice on the black sections. Structurally though things appear well, the running boards and wings are straight and solid, and the doors open and close well which is a big relief. A gentle attempt with the starting handle revealed a stuck engine, probably due to someone leaving all the spark plugs out in the past. So quite what the Daimler's mechanical condition is I really don't know. The return trip home was completed without incident, and for a while at a services en route the Daimler was joined by a vintage Austin Chummy, also being towed on a trailer. Many Daimlers and Lanchesters of the 1930s were fitted with coachwork by Mulliners of Birmingham. In appearance, the car's styling is not dissimilar to a Morris 10/4 Coupe I once owned, but in detail it is very different. The bootlid for instance on the Morris was a single sheet of steel, with rolled edges. The Daimler's bootlid is a hefty ash-framed construction, over which a steel skin is fitted. Unusually, it is side-hinged as shown in the photo below, and is held aloft by a chrome-plated folding stay. The wooden boot floor is in excellent condition, and found within it amongst a few odd bits of junk, I found an original leather radiator muff in tidy condition, and the original driver's flat cap! With the exception of the disintegrating headlining, the interior is in surprisingly decent condition, and most of it can be preserved, even the bound-edged carpets. The door panels are good, and the front seats will respond to a clean and hide food. The pneumatic balloon used to inflate the rear seat squab has long since collapsed, so a replacement solution will be needed for that, although again the covering is in a reasonable state. The original rope pulls are in place, as is the rear window blind, operated by a cable that runs to the roof above the driver's right shoulder. The dashboard also appears to be complete. The missing Jaeger clock turned up in the former owner's house - he'd removed a few items after a break-in at the lock-up including the clock, and also the dummy "pram irons" that fit to the roof. Screwed to the dash is a dealer plaque for Parker Thomas and Company Limited of Southsea. Whether this was the original supplying Daimler agency, or a company that sold the car secondhand, I'm not sure. There is evidence of another plaque once fitted to the dash on the passenger side. It was a horizontal plaque, in a diamond shape, but which company it relates to I don't know. What did turn up though was the original tax disc holder, in which a disc for August 1961 (the last time it was on the road?) was displayed. Behind it, two more discs, for 1958 and 1959 were found. Apparently more paperwork relating to the car should still survive in the former owner's home, so I'm hoping for good news on that score. After further hunting around, I found the chassis plate, affixed to the top of the chassis, ahead of the passenger footwell. Shortly after buying the Daimler, I contacted the Kithead Trust. They maintain a large number of vehicle records from the days before centralisation at DVLA, and a check of their archives uncovered a record card relating to a change of owner address dating to 1952, and they sent me a copy. The bonnet is a three-piece affair. The top is hinged at the rear, while both side panels are removable, offering excellent accessibility to the under-bonnet area for a car of this age. The engine is a six-cylinder, overhead valve unit. Initially on the Daimler 15's launch in 1932 the capacity was 1,805cc, although in 1934 - the date of this car - it was increased to 2,003cc. Which unit is in my car I'm not sure yet, both were fed by a single SU carburettor and AC mechanical fuel pump. Earlier cars were fitted with hydraulic brakes but mine has the later Girling, mechanical arrangement, which I prefer. A four-speed pre-selector gearbox is fitted as standard, driving to the underslung rear axle. The first job to do, after swapping the n/s/r wheel for the spare which held air, was to make a start on cleaning the Daimler. Several buckets of soapy water later and the two-tone paint finish better revealed itself. In its day it must have looked very smart - happily the family selling the Daimler discovered a photo from the 1940s or 1950s showing the car in its earlier years. At this point I re-positioned the original fake pram irons onto the roof, although I need to find some suitable chrome, dome-headed nuts to hold them on. An interesting detail is the drain tube outlet fitted low down, ahead of each rear wing, acting as outlets for the sunroof drain tubes. A local VSCC-er called by on his 1932 x-frame bicycle to view this latest acquisition. I'd not normally buy a non-running, non-driving car like this without seeing it in person or knowing anything of its mechanical or bodily condition, but sometimes it's worth a gamble. Bodily it appears to be in pretty good order, although the existence of any original paperwork, and all aspects of the Daimler's mechanical condition, continue to be unknown. Most of the corrosion is to the surface of the panels only, with just a few minor areas of rust-through evident on the body, close to the sunroof drain outlets. Some time after finding the car, and after much soul-searching, I sold the Daimler, as part of a bigger plan to cut back on project vehicles that all needed heaps of time, and not a little money spent on them. It was a shame to see it go, but the new owner assures me that he'll restore it back to roadworthiness. Click here to see some of the other old motors I've had since 1985.